Mukurwe wa Nyagathanga is the mythical garden of Eden of the Gikuyu tribe of central Kenya. It is also the central point of dispersal of the Gikuyu after arrival into the Mt. Kenya area. According to the myth, God, Ngai took the first Gikuyu man up to his abode on top of Mt. 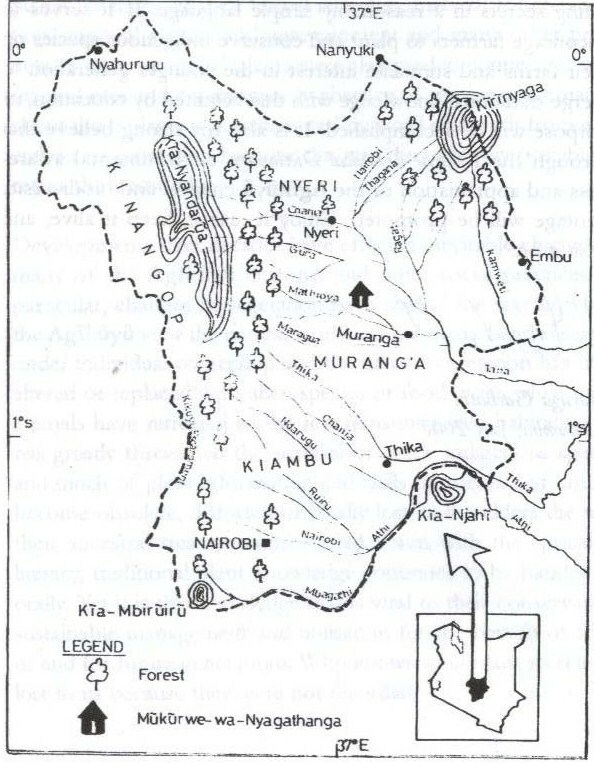 Kenya, Kiri-Nyaga, and showed him all the land pointing to the Aberdare Mountain ranges (Nyandarwa) to the west, Ngong Hills (Kia Mbiruiru) to the South and the Ol donyo Sabuk (Kia Njahi) to the South east. (see map). God told him, “All that land between those mountains and here is yours. Whenever you need me, pray to me facing those mountains and I will answer you. Now go and setlle at that place near that giant Mukuyu fig tree and build a house for your wife.” Gikuyu then discended and went to the place he had been directed to and there found a woman waiting for him. The woman’s name was Mumbi, which means Creator or Potter. They settled in the place and had nine plus one daughters but no sons. 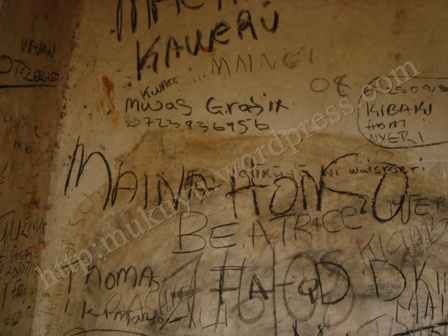 This place of origin has traditionally been identified as Mukurwe wa Nyagathanga near present day Muranga. The daughters names were, Wanjiru, Wambui, Wanjiku, Wangari, Waceera, Wakiuru, Waithira, Wairimu, Wangui, and Wamuyu. After some time Gikuyu felt that his daughters needed to get married and he went and prayed to Ngai and Ngai answered him requesting the sacrifice of a spotless goat at the foot of the Mukuyu and for Gikuyu to return early in the morning to the spot. On arrival at the fig tree the following morning he found nine young men waiting and he took them home. Each of the girls took a mate who was her height. Wamuyu was left to stay without a husband as she was too young to marry. These nine couples went on to establish their own homesteads and are the source, together with Wamuyu of the Nine plus One Gikuyu clans. Mukurwe wa Nyagathanga today attracts curious Gikuyu who want to know their history and also tourists who want to find out more about the tribe. It is also used by the Gikuyu political elite to rally the tribe around a common cause. Gikuyu traditional religious men also visit the place from time to time to make sacrifices and prayers. The Muranga county together with the Ministry of Culture and Social Services have been trying for years to develop some form of cultural center where people could come and learn more of their culture, a sort of museum. I should think the Kenya National Museums are involved in the project though I am not sure. For now what there is is an abandoned project in serious decay. There is an ignorant attempt at reproducing Gikuyu traditional architecture and some men from around the village who saunter in when they see a van of visitors and who give a rudimentary introduction to the place. Usually they earn themselves a few coins from the grateful visitors. Below are some of the images of the place as it is. Definitely not a garden of Eden and even less worthy of a visit from anyone wanting to understand more about the Gikuyu. On the left is the “sacred tree”. This is actually a Muringa tree (Cordia africana) and not the mythical fig tree, Mukuyu, (Ficus sycomorus). The lower branches and the trunk were recently burnt by a fire which was started by a religious man of the Akurinu sect who had come to perform some rituals. The huts on the right supposedly represent the traditional huts like Gikuyu and Mumbi could have built. Above a fireplace on a cement screed floor and a bed of bamboo on the right. Above, the entrance to the yet unfinished Cultural Centre and the performance hall to the left. Above, the rest cabins are ten named after the nine plus one clans and a reception on the right. Notice the high walls and short eaves resulting in a dirty wall above plinth from splash. Luckily the walls are in stone and cement plastered. If they were mud walls they could not survive that kind of treatment. Above, inside the walls of the Cultural Centre. This is their visitors book where people sign. Updates are also regularly posted on the wall. Above, visitors being given the stories and myths by guides. should wake up and be proud of this heritage site. A lot will have to be done so as to make it attractive. Which plans are you having so as to attract many people on the site.I think the site should one of the best nationwide if given better look. I think Murang’a County is working on it. Its one of their major attractions. I am a graduate of Anthropology from the University of Nairobi who just visited the site and quite liked what I saw. I met a very resourceful old man called Kimani who gave me some ‘kirira'(counsel), took me round the site and later led me in a prayer to the Kikuyu God – Mwene Nyaga. I have started experiencing real blessings! 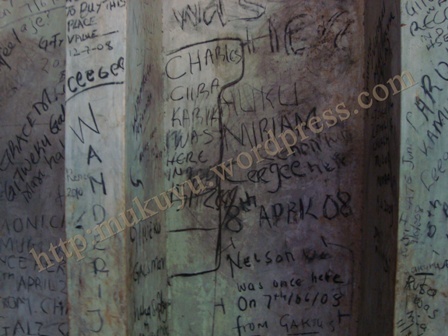 mukurwe wa nyagathanga isnt mythical, it is in fact one of Gikuyu’s holiest places. I absolutely agree with you Njoroge Munyui, its not mythical and we should not allow our heritage to be undermined. We should stand in unison and be PROUD OF OUR HERITAGE!! !